After the German Occupation of France in June 1940 it did not take long before restrictions were enforced on the Jewish communities Occupied France. One Frenchwoman who was prohibited from exercising her right to continue as a Classics teacher - Greek and Latin - at the Lycée Victor Hugo in the 3rd arrondissement of Paris was Renée Léa Lévy (1906 - 1943). Refusing an offer from friends to seek refuge far from Paris in an Alpine village, Renée Lévy became one of the first French people to join the Resistance movement. Initially, Renée Lévy joined the resistance group at the Musée de l'Homme (the Museum of Mankind) led by the anti-fascist Paul Rivet and others who were based at the museum. 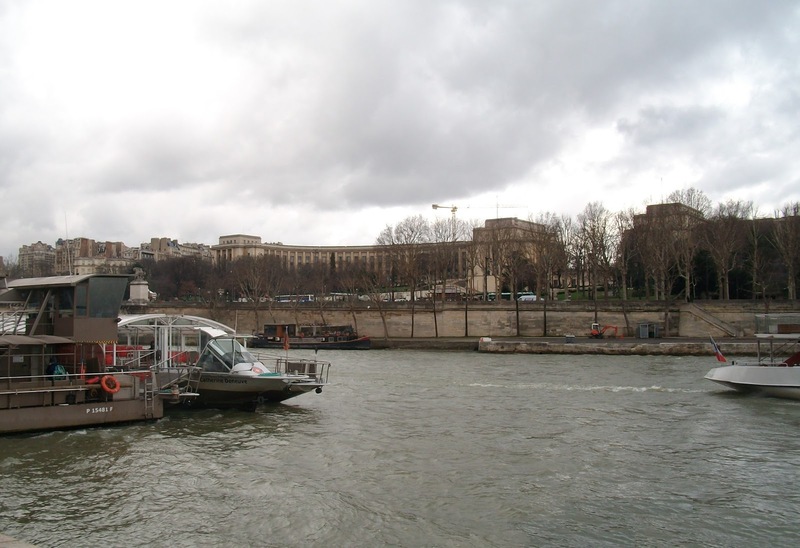 This museum is situated in the Palais de Chaillot, Trocadero, Paris (Photograph No 1 above). The country is not with you. France is no longer with you". "God protect France" (« Dieu protège la France »). "................. Sleep to gather strength for the morning. For the morning will come. Brightly it will shine on the brave and true, kindly upon all who suffer for the cause, glorious upon the tombs of heroes. Thus will shine the dawn! Vive la France!" Members of the Resistance Group based at the Museum of Mankind, including Renée Lévy, distributed clandestine newspapers and leaflets containing Winston Churchill's speech. However, this early Resistance group did not last long. It was infiltrated by the German Abwehr and disbanded. Several of the group would subsequently be executed. This included Renée Lévy. Following the disbanding of the Museum Group, Renée Lévy then joined the Hector Network, a group founded by Alfred Heurteaux. Renée Lévy became a radio operator. By using a hidden radio transmitter she was able to transmit details to London that had been collected by members of the network, such as German troop movements. Then, on 25 October 1941 Renée Lévy was arrested after having been denounced. Firstly, she was incarcerated in the notorious La Santé prison at Paris. She would not remain there long. By the German policy of "Night and Fog" ("Nacht und Nebel" / "Nuit et Brouillard") Renée Lévy was one of the many political prisoners who were spirited away without trace. This happened on 11 February 1942. According to the later testimony of fellow prisoners, Renée Lévy was next taken to Aix-la-Chapelle and then to Essen. On 30 April 1943, she appeared before a court in Koblenz. The verdict was a foregone conclusion: Guilty. A death sentence was pronounced. It would not be commuted to a term of imprisonment. "I am a Frenchwoman and I have been serving my country. I regret only that I have not been able to do more." « Je suis Française et j'ai bien fait de servir mon pays. Je regrette seulement de n'avoir pas pu en faire davantage ». The execution was brutal. Renée Lévy was beheaded by axe. Thus ended the mortal life of this outstandingly courageous and inspirational Frenchwoman. Yet, she would not be forgotten. Renée Léa Lévy was born at Auxerre in the French department of Yonne (89) on 25 September 1906. She was born into an academic family of hard workers and high achievers. Renée Lévy was the daughter of Léon and Berthe Lucie Lévy. She had an elder sister, Germaine (1899 - 1943) who was to lose her life in the Holocaust. Germaine Grun (née Lévy) was among the French Jewish people deported from Drancy to the Auschwitz / Birkenau extermination camp (Convoy No. 48, 13 February 1943). Renée Lévy's paternal grandfather, Alfred Lévy (1840 - 1919), was the Chief Rabbi of France between 1907 and 1919. One of the grandsons of Alfred Lévy - and a cousin of Renée Lévy - Robert Gamzon (1905 - 1961), was the founder of the Jewish branch of French Scouts. During WW2, Robert Gamzon also became one of the main figures of the Jewish Resistance movement throughout France. Renée Lévy's father died at the age of 45 in 1909. In 1912 Mme. Berthe Lévy moved the family to Paris and took up a teaching post at the Lycée Victor Hugo (Paris III). This was the same educational establishment where her daughter Renée would later become a teacher. After studying Classics at the Sorbonne, Paris, Renée Lévy qualified in 1932 obtaining the 'agrégation', the highest competitive examination in France for teachers. Her first teaching post was the Lycée Fénelon, Lille (59), which at that time was a girl's school. She subsequently returned to Paris to teach at the Lycée Victor-Duruy for a short time. Then, as referred to earlier, Renée Lévy obtained a teaching post at the Lycée Victor Hugo - where her mother had taught as well as being her own 'alma mater'. 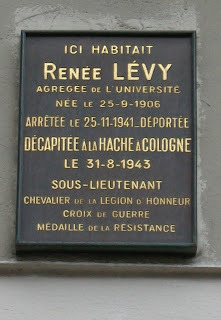 After the war a memorial tablet commemorating Renée Lévy's link to the school was erected in the lobby of the Lycée Victor Hugo. 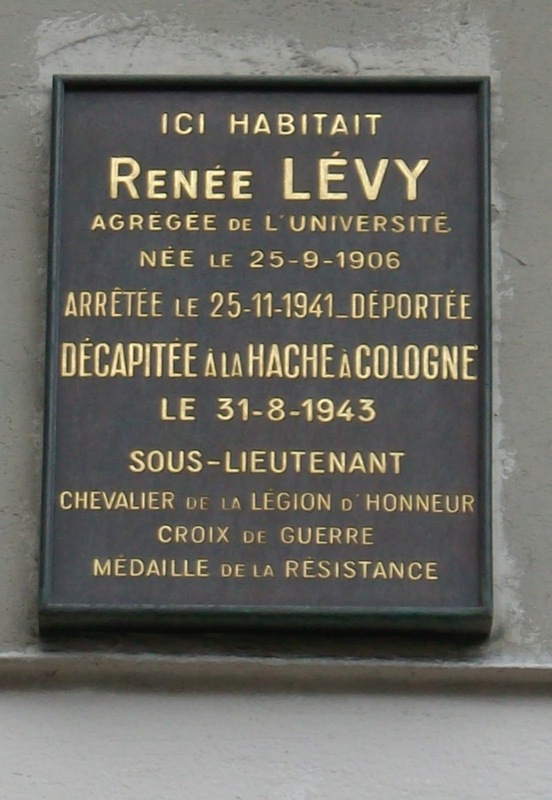 After WW2, the mortal remains of Renée Lévy were returned to France. She was chosen to be one of 15 of the 'Fighting French' to be killed during WW2 to be laid to rest at what would become the National Memorial based at Mont-Valérien, Suresnes to the west of Paris. The former fort of Mont-Valérien was used by the Nazi Occupiers as a place of execution for male prisoners during the war. Between 1940 and 1944 more than 1,000 prisoners, including at least 7 members of the 'Musée de l'Homme' Resistance Group, were executed by firing squad at this place. Thus, on Armistice Day, 11 November 1945, General Charles de Gaulle - then President of the Provisional French Government - led an imposing ceremony. Renée Lévy and the remains of the other 14 'Fighting French' were taken to Mont-Valerién with due honour and solemnity and their coffins placed in the crypt (a 16th was added at a later date). In addition, in the post-war years Renée Lévy was posthumously awarded the Croix de guerre and the Resistance Medal ('Médaille de la Résistance') in 1946 and the Knight's Cross (croix de chevalier) of the 'Légion d'honneur' in 1955. 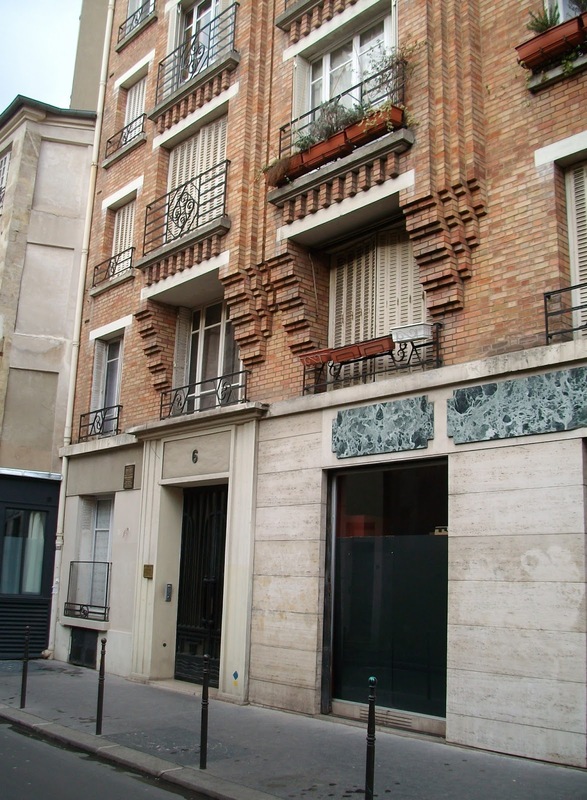 Her Paris home was at 6 rue de Normandie in the 3rd arrondissement of Paris not far from the Lycée Victor Hugo (Photograph No 2 above). High up on the wall, to the left of the front entrance to this apartment block, is a memorial tablet commemorating Renée Lévy (Photograph No 3 above). On 18 June 1960 - the 20th anniversary of General de Gaulle's famous radio 'Appeal' to the French nation - President Charles de Gaulle officially opened the Mont-Valerién Monument of Fighting France. The 16 coffins, symbolising the different forms of combat between the General's 1940 'Appeal' and the Liberation in 1944, were given a special place in the crypt of this WW2 memorial. Renée Lévy is one of the two women whose remains were placed in the Mont-Valerién crypt. The other woman interred in the Mont-Valerién crypt is Berthie Albrecht (1893 - 1943) one of the co-founders of the 'Combat' resistance group. Décapitée à la hache à Cologne le 31-8-1943. Médaille de la Résistance ». arrested on 25-11-1941 and deported. Beheaded by an axe at Cologne on 31-8-1943. Renée Léa Lévy (1906 - 1943). « Honneur et Patrie ».